1. Swapping, thrifting, up-cycling, and regifting are all great ways to be more sustainable this holiday. There’s no doubt that the holidays can be a lot of fun. Office parties. Presents. Cookies. All things to smile about, for sure. But it’s also true that a lot of waste comes with all that fun. Maybe it’s delicious food being thrown away after a party, or it’s a sweater your lovely aunt gave that you have no intention of ever wearing. 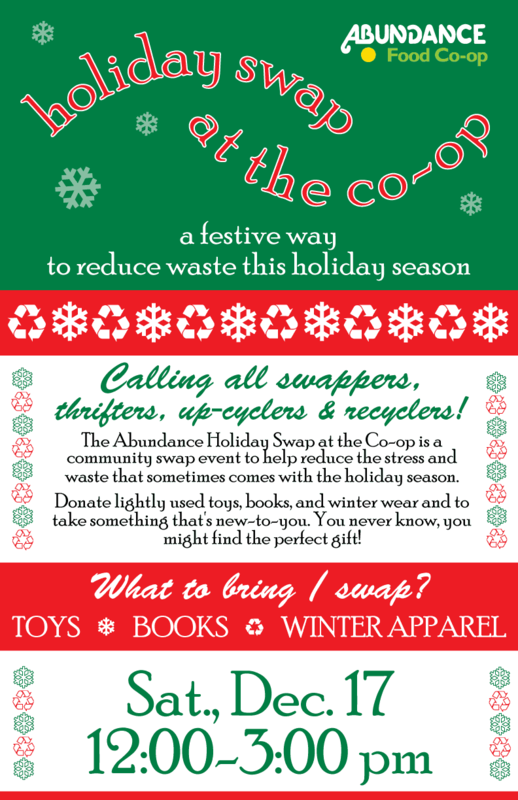 The Abundance Holiday Swap at the Co-op is a cheerful way of countering that waste with awesomeness! 2. Giving gifts feels good. Giving a truly unique, thoughtful gift feels great. Try as you might, it’s hard to find a genuinely unique gift these days. Usually the thing you buy is next to a whole bunch of items just like it. And you know what that means? Other people are buying the same thing as you. Sad, isn’t it? Luckily, there’s another way to find that amazing gift, free from the hum-drum crowd: swapping, thrifting, up-cycling, recycling, and regifting! We’ll have some pretty rare and wonderful toys, books, and winter wear at the Holiday Swap at the Co-op, and you might just find the thing that shines for you. 3. You’ll get to pick up some tasty, delicious holiday treats while you’re here. In case you didn’t know, we’re quite the place to discover tastes and delights you can’t find anywhere else. This is especially true when it comes to finding those nice little touches that really give a gift that little extra something, or when you need a gift that’s nice-but-little for a work colleague or an acquaintance. 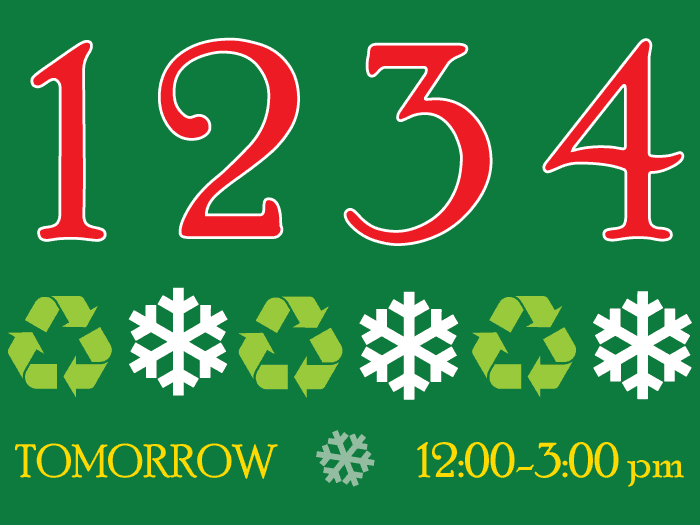 For the Holiday Swap at the Co-op and throughout next week, we’ll have lots of options on display for you to explore. These include fair trade chocolates, tasty organic items perfect for hors d’oeuvres, and wonderful sparkling juices and local, seasonal beers and ciders. We’ll have a special treat on offer tomorrow: Abundance Holiday Cookie Samplers! Each bag will be filled with 15 mini-cookies featuring three varieties: cherry chocolate chip cookies (vegan), ginger snaps, and Italian sesame cookies. Be sure to pick up a bag, just $3.99! 4. Because hot cocoa is delicious! We’ll have some for you to enjoy while you browse the tables, on the house. Come and enjoy a cup of hot cocoa while you browse the swap selection! We will have dairy and non-dairy options.